My contemporaneous notes from a particular INFORMS Marketing Science Conference six years ago feature the letters W, T, and F scrawled in the margins a few times. I learned of a deeper problem lurking in the way we were using the crosstab to identify segmentation. In this post, I’ll unpack a heap of jargon and lay the concern bare. To the twenty or so marketing scientists in the room at the time, I read concern on the faces of about a dozen. It was a atypical because typically that community doesn’t get concerned about too much. One leader remarked that most in industry were not even executing basic segmentation on their users, so it wasn’t a huge industrial concern, but for marketing scientists in academia, this could be a very bad problem. For industry, for market researchers, it was about reporting basic univariate means – that 22% of consumers would buy purple paper towel, or that Obama would win 51% of the popular vote – were no problem and where the action was. Segmenting consumers, that 55% of women with dogs bought paper towel, was a different matter. Another gentleman, one of the four grandees I knew from the era, repeated, as though to wave everybody else off from the problem, that somebody he had supervised in the past was working the underling problem. If the presentation ever made it to publication, I can’t find it. And I’m having a very tough time locating the specific author, or if there was ever just a simple resolution. The problem originates with the way we understand ground truth. So let’s start there an unpack it all. Assume a Universe. This Universe exists entirely within the RAM of my machine. Or yours. And in this Universe, I create a hundred thousand humans. And I assert two things about each of them. Attribute A and Action B. Either somebody has Attribute A, or they don’t. They either have a 1, or a 0. And they will imminently do Action B. They will either do B, a 1, or they won’t, a 0. If it helps you to think about Attribute A in a concrete term, you can associate it age. Either somebody has accrued 35 years on Earth-RAM, or they have not. They are either 35 years old, a 1, or they are not. And if helps you to think about Action B, you can think of it as they will either Buy brand B, a 1, or they will not, a 0. It doesn’t really matter. A is a 1 or a 0. And B is a 1 or a 0. Because I have created this Universe, there are no missing values. There are no import errors. There is no number 2. Or -1. There are certainly no special characters. There is only cold, sterile, dichotomous, data. This data, of 100,000 perfect people in a perfect bank of RAM in a machine is the absolute ground truth of the Universe. Many of you may feel bad for those people, but that’s because you’re crazy, they have no feelings, and their existence in this Universe is much better. This is what I tell the computer to create this Universe. As a God, I can run a query and discover the true, actual, ground truth of the Universe at any time. This forms the basis of all Judgement to come. And while I’m playing God, I’m going to instantiate twenty special agents – and task them with a few challenges. First, I’m going to ask these agents to estimate, out of the 100,000 humans, do a majority of humans have Attribute A? How many have Attribute A? Since I’m also a frugal God, and not much into apotheosis, I’m not just going to give these twenty agents read access to the entire human database. I’ll give them the ability to sample it. They may have a slice to check for the attribute. These agents are able to sample at random – one may be able to interview human 99, 107, 998…and so on. One may coincidentally interview humans 998,000 to 998,999. Their interview list is generated randomly and independently from each other. The humans in RAM can’t refuse to respond. They have to respond. And they have to respond honestly. And they do respond. They get to ask 100 humans what they are. The agents do not make a mistake in recording the responses or tabulating means. They have no feelings about what the answer should be. What I’ve set up here is a simulation. It’s a controlled environment mostly free from most of the problems caused by the real Universe out there. How would twenty agents answer the question, how many humans have Attribute A. Put a different way, how many humans in the Universe have a 1 under column A? They’d probably add up all the ‘1” they got from those 100 humans and apply that average to the 100,000. It would stand to reason that if they asked 100 humans, and 50 of them had attribute A, that 50% of all humans would have attribute A. What do you think these twenty agents would come back with? Would they all come back with the same answer? Would they all literally say 50%. How probable do you that is? That probably depends on the underlining distribution. What if the randomness of the birth of this Universe produced more than 50% with Attribute A? Or less than 50%? Wouldn’t one expect np.random, or the random function contained in the numpy library, a random function, to produce something that isn’t perfectly 50%? It would also depend on the random sample that the agent is pulling too. They’re polling 100 humans from a random list they, themselves, produce at random. And what are the odds that each agent, operating independently of each other, is going to draw the exact same 100 humans to poll? It really isn’t likely. These twenty agents are going to return different lists of 1’s and 0’s, 100 items long, and arrive at a different percentage estimate of the ground truth. And remember, nobody, other than the God, which is me, knows the real ground truth. Here’s how my agents did on the first run of the Universe. It’s a sorted list of what each Agent reported back, as a decimal. If it says 0.42 in the table, it can be interpreted as 42%. I sorted the list to make it easier to read. Below, you can see that Agent 3 predicted 42%. Agent 7, and Agent 9 both predicted 50%. Agent 4 predicted 60%. That’s a total range of 18 percentage points! Isn’t that interesting? It isn’t that Agent 4 is a bad person, any more than Agent 3 is a bad person. They just happened to generate very different lists, from the same Universe, and arrived at very different answers. And, you don’t know for sure if Agent 4 is right. Or if Agent 3 is right. You might be eyeballing that list, and your gut might be telling you something. The agents, in aggregate, are returning a distribution of answers that are clustering around some figure in the middle, aren’t they? And maybe you reach for those classic summary statistics, the mean and the median, to describe the list. Maybe you take the average of the averages and end up at 49.75%. Maybe you take the median at 50%? All of these estimates, in total, are clumping near the middle. It turns out, in this instance, the ground truth in this Universe was that 50,058 humans had Attribute A, so the Ground Truth was 50.058%. 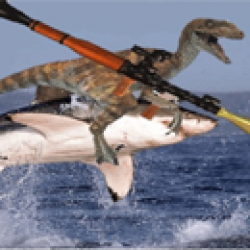 Why would God allow such a Universe to exist?!? 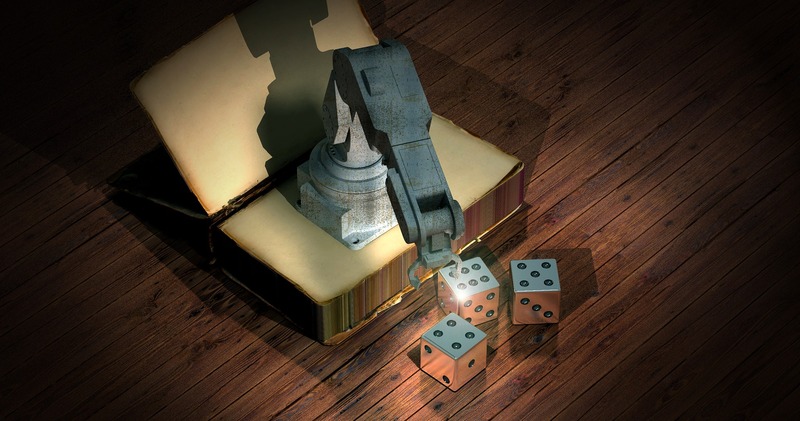 God plays dice. Let’s spool up another Universe, and this time, let’s loosen the strings up a bit on our Agents. Let’s gift them ten times the information. Let’s grant them the RAM to ask 1,000 random humans. What then? Two very interesting things happen. For one, a set of 1000 allows for more precision in their estimates. And, second, the range is a lot tighter, just 4.5% points separate Agent 2 from Agent 13. So based off these twenty estimates, what would you say the ground truth is? Is Agent 0 right at their 50.0% estimate? Is Agent 7 at 50.4%? The mean and the median are very close to each other, around 0.504, or 50.4%. Do you feel more confident that more than half of the humans in this Universe have Attribute A? The actual ground truth, in this example, was that 49,677 out of 100,000 humans had Attribute A. Agent 11 was more right than others. And again, just out of pure chance. Did you feel the precision in the figures give you a false sense of confidence? Did you feel that? Insidious, isn’t? I’m going to give these agents a sample size of 10,000! Such generosity! Each agent is more precise. And the range went from 0.045 to 0.0136, (4.5% down to 1.36%). Which is a bit disappointing isn’t, since I increased the the amount of sample given to each agent by a factor of 10 and only got a four factor increase in accuracy. And all twenty agents are estimating figures far away from 50%, they’re all down at around 20%. Is Agent 3 right, at 19.93%? Is it weird that Agent 4 and Agent 8 both agree so much at 20.00%? The average of the average is right around Agent 3, 4, and 8 at 0.199, or 19.9%. Could they all be so wrong? Because God microwaved the dice. I set p=[0.80, 0.20], manipulated the plastic in those bad boys, causing the dice to bounce a certain way – giving the odds a 20% chance of Attribute A for each human. But there was still chance at work. You may have anchored on 0.50, so when you saw so many outliers, you may have thought there was something wrong with the agents. Alright, so now you have some intuition for how simulation can help you understand more about the wonderful world of univariate statistics and making predictions about the ground truth of the Universe. Controlled Universe. Controlled Agents. One variable. One prediction. Why we call it univariate (uni = one) analysis. And there’s still quite a bit of randomness. As the amount of information made available to each agent increased, the accuracy of their predictions became better. They got better, even if it didn’t get as better as the size of data they got. I increased the amount of data they had access to by two orders of magnitude, from 100 to 10,000, and they only got better from being 9 percentage points off (18 was the total range, the agents were within 9 points of the mean) to almost a one percentage point off. And the rate that predictions get better, themselves, generalize into a predictable formula. Mathematical scientists have in turn discovered a whole bunch of observations about the way this relationship works, assigned Greek letters to some of the concepts, and have been working ever since. This is the intuition at the root of how nature, of how randomness and chance, even against a ground truth, generalize out in the world of univariate analysis. But because we come to know nature, we can manage that, and ourselves. Now we’re going to compare two things. I’m spooling up a Universe and setting A and B. And now I’m going to ask my twenty agents – how many of those with Attribute A are going to do Action B? Stated a slightly different way, how many humans have a 1 in both columns, A and B? I’m going to start off by giving each agent 100 humans to interview. Same rules apply as above. Here’s what Agent 6 put together from their sample. Here’s how to read that crosstab (sometimes it’s called a contingency table). Agent 6 interviewed 100 people. Of them, 54 had attribute A. And 36 did Action B. Agent 6 found that 17 people that had attribute A, also did Action B.
I’m reporting each agent’s count of those that had 1’s in each column, 1 for Attribute A, and a 1 for Action B. And as you can see, agents would estimate a value as low as 17 (Agent 6) to as high as twice that, 38 (Agent 1)! It’s trivial here to put those into percentages – a range that varies from 17% to 38%. The ground truth figure was 25,180, (or 25.180% had both Attribute A and did Action B). So what happens when I give the agents a sample of 1000? And we find that the agents are returning a tighter range, which is what we expected. And it tightens. Agent Zero estimates 21.9%, Agent Four estimates 27.0%. Which are much tighter in against the ground truth, which was 25.202%. So what happens when I give the agents a sample of 10000? And we find that the estimates are narrowed again. Which is good, against the ground truth of the situation. So as you can see, more information helps the agents greatly in making a more accurate estimate of the ground truth. Next, I’m going to ask my agents a different question – what is the relationship between Attribute A, and Action B? So I recreate the Universe, and give every agent a sample of 100. Here’s what Agent 17 discovered when they went out into the Universe. So what can deduce about the Ground Truth of the Universe from this distribution? Well perhaps not much. If Attribute A had nothing to do with Action B, one might expect there to be a number around 25 in each cell. The number of people with Attribute A and doing Action B would be around 25 (And down below, I’ll report out the expected values). And we look above, and we can see that the Agent can’t really make a prediction using information about A. If Agent 17 was sitting in a room, and I sent a human at random in there, and the person said if they had Attribute A, the Agent might guess that they were going to do Action B in the future (23/48 = ~48%). But given how small the numbers are, Agent 17 couldn’t really say for sure. They wouldn’t be very confident in that prediction. Agent 5 would have a different relationship with reality based on their experience. Take a look at what Agent 5 discovered. Agent 5 found that if somebody had Attribute A, 31 times out of 49, that human also did Action B (63% of the time). That’s pretty lopsided. So if you sent a random human into a room with Agent 5, and that human said they had Attribute A, Agent 5 would estimate they’d have a 63% chance that the human would do Action B. They might be pretty confident about that prediction. That relationship, between a prediction and the confidence in it is quantified in a bunch of equations, rooted in observations, and expressed in Greek letters. I’m going to give them the gift of knowing about a Greek Letter called Chi, and have them report what they calculate. The way Chi Squared is calculated is by taking the difference between what the agent observes in each cell in the crostab table, and what the agent would expect to see if there was no relationship between A and B, and then square it. Then they divide that number by what was expected. Add all of these together and one gets the Chi Squared value. (The Greek letter Chi looks like a Latin X). For intuition, the greater the excursion from what’s expected, the greater the Chi Squared value. The relationship between the Chi Squared value and the probability that it’s independent is moderated by a concept called the degrees of freedom. We have a 2×2 crosstab table here, so the total number of degrees of freedom is just 1. Just one degree of freedom. Check out the black line, the one furthest to the bottom of the chart, below. I’m going to ask all 20 agents to report on back to me how sure they are that there is no relationship between Attribute A and Action B. Agent 17 reports a 99.3610601185% chance that there is no relationship between Attribute A and Action B. As does Agent 15. Agent 5 reports a 4.44300910571% chance that there is no relationship between Attribute A and Action B. And you can see here, the chances that there is no relationship between A and B vary from 4.44% all the way to 99.36%. Now remember, everything in Agent 4’s experience tells them that there are pretty good odds that there is a relationship between A and B. What effect does giving my agents more sample have? Let’s increase it by a factor of 10. And we check out the probabilities that the A isn’t related to B. And we see right away that Agent 6 has something unusual. Agent 6 observed 273 people with both Attribute A and Action B – so they could predict that somebody doing Action B, given Action, 54.5% of the time, which is better than even odds. They report that there’s just a 3.6958% chance that the relationship between A and B is a fluke. This is their experience. All the other agents report that there’s no relationship between A and B. What about the ground truth of Universe? Nope. There isn’t a relationship. There’s no relationship between A and B.
Let’s amp the sample size up to 10,000 and see what happens. Agent Zero, even with 10,000 in sample, reported a relationship. Even though the Ground Truth, indeed, indicates that A and B are not related. Again, Agent Zero isn’t a bad human. It’s just that they got unlucky. Their experience of the Universe leads them to believe that there is a relationship between A and B, even though there isn’t. Even with a sample of 10,000. In all Four of these Universes, there was no relationship between A and B. Aside from showing you the ground truth and the related statistics, I can prove it by showing you the way I created the Universe. A and B are independent because they were created independently. They were willed into being using two separate random distributions, at two different times (one followed the other) and they have nothing to do with each other, other than existing in the same Simulated Universe together. The fact that it seemed like usually, one agent out of twenty always thought there was a relationship is predictable. It’s just that no agent ever believes that they’d be so unlucky. The P-value range doesn’t become any tighter or more consistent, across the agents, as sample goes up. There is no tightening of certainty at scale. What if I create a universe where A is related to B? What if A is correlated to B. What if they’re not only just correlated, but I make A cause B? Naked. Pure. Causality. So I set the agents sample size to 100. And they all come back with very low p-values. As you can see, one would expect 30.8 people in the sample to have 1′ both A and B, and the observed value was 49. Add up all of these variations, and we get a high chi squared value of 51, which produces a very low p-value. If a person walked into a room with Agent Five and told them they had Attribute A, they’d predict that the person would do Action B 90% of the time. And that’s within a good range of what Universe says it really is – what the ground truth really is – it’s pretty close. And the Agent’s generally agree with the ground truth of the Universe. And these agree with the Universe. Our Agents are able to make good statements about relationships when God is leaning, 80/20, on the Universe. What happens to the Agent’s ability to predict if we don’t make it so obvious? In this Universe, there’s a 50/50 chance of having Attribute A, and if given Attribute A, there’s a 55% chance of doing Action A. The dependence of B on A is quite a bit more nuanced, but you see that it’s still there. Four agents out of twenty, 16, 14, 9, and 1, experienced P-Values that are less than 0.05. And this Universe is very, very clear – there is dependence. Let’s see if more data helps my agents make better predictions? And in this instance, all agents but two, 16 and 13, experienced P-values less than 0.05. Pretty good. We boost the sample to 10,000 each. And the P-values narrow even more. All the Agents would agree – B and A are correlated. And they match up with the Universe. What if I make a Universe where Attribute A is anomalous – just 5% probability that a human would have it, and what if it just gives that 55/45 Action B split? Note that there’s still a causal arrow in the data. It’s just a lot weaker. And I start off the Agents with a sample of just 100. And we see that none of the agents were able to spot the dependence. Even though in this Universe, it is there. So, we’re going to boost the sample to 1000. And we find that six agents are able to pick it up. And we find that all the agents pick it up. Which agrees with the Universe. A lot more sample helped the agents understand that a small relationship, within an anomaly (at 5% of the humans having Attribute A) was present in the Universe. Much of the work that is segmentation is about observing some Attribute A, and running test for correlation against some Action B. The machinery around the word because, is made by the human involved, not the chi square test of the p-value. Chi and p make no statement about causality, they just make a prediction about independence. The reason for bothering with chi and p-value in the first place is because if one can understand the relationship between an Attribute and an Outcome, they can predict it, and prediction is the key to acting. Many commercial segmentations one encounters make use of multiple Attributes, like age, gender, income, previous purchase, number of children, marital status, and location, to make a prediction. This increases the number of degrees of freedom, which i turn has a predictable effect on p-values and each agent’s ability to reject the null the hypothesis, or discover exploitable knowledge. 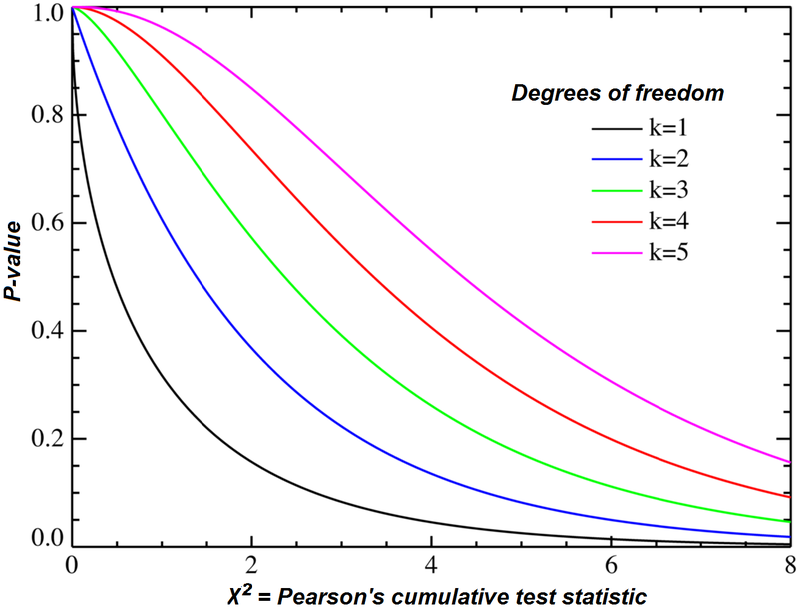 In the end, most segmentation boils back to a 2×2 Pearson’s Chi Square test with a single degree of freedom. One either has the attribute of 35+Male+Lower_Income+3children+married+urban, or not. That accumulation of attributes into a single one has the effect of reducing the size of a single cell where the 1 and the 1 line up, that true-positive, sweet spot. One pays the cost of uncertainty by either inflating the degrees of freedom or reducing the size of the segment. The generalized concern, the problem, is the sensitivity of the statistical test for independence, to the size of the segment, is much greater than is generally understood. In the simulations in this post, we demonstrated that even with a sample size of 1000, just six agents were able to pick up (at p < 0.05) on a segment that was clearly there (5% of the population), with an exploitable feature (55:45 for purchase). In fact, the number of agents that were able to detect the segment were [4, 4, 4, 6, 3] on successive runs. This took place in a simulation. In a world that I created, with a direct, and I assert, causal link, between A, and then the generation of B. The sample was pulled, at random, from the Universe. And, we knew the Ground Truth of the Universe with absolute certainty (because we created it). There’s none of the usual problems with the real Universe. No census whose credibility we can quibble about. No transcription error. No pesky human with a fat finger. No liars. And nowhere did the God get shifty and changed Confidence Levels randomly. The agents were all super sharp and good professionals. The segment was there, and, most agents missed it. If the sample size is increased to 3000, a general size, we get a boost in the predicability – as [12, 13, 12, 10, 15] agents managed to pick it up (p<0.05). Again, that sensitivity, from 1000 to 3000, is the difference between most commercial sampling studies. So what, one might say, why sample when I have all the data? We simulated several universes where there was absolute independence between A and B, and we found, consistently, that one agent in twenty was finding evidence of dependence. We saw this often. At industry conferences, I have encountered practitioners that will argue the correlation must exist if it was discovered, even in the case of correlating an astrological sign with the medication condition of breaking a leg. They insist that it is a problem with the sampling, or that more sample size always solves the problem. However, even with this sterile, simulated, data, sampling 10,000 records out of a ground truth of 100,000, one agent was still tricked by randomness into stating there was an exploitable segment when there very clearly wasn’t one. You now have more intuition about the structure of the Universe than they do. Six years ago I wrote WTF repeatedly in the margins during a presentation. What I learned there worried me, and it wasn’t until I started running more simulations on my own that I truly appreciated what was happening deep down there. The best practical advice that I can offer data scientists in industry is to look for big, bold, segments. Look for big chi squares and very tiny p-values. Be aware that a promising segment might not actually exist even if the p-value is under 0.05, or even under 0.01. You may be an unlucky agent. And you wouldn’t know any different.